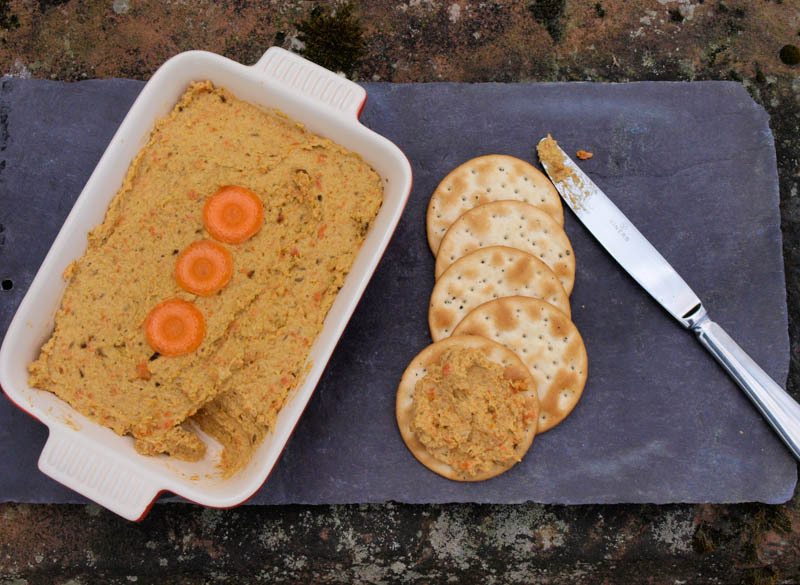 I can't recommend this Roasted Carrot Hummus highly enough, it is so good. It's one of the recipes in the One-Pot Gourmet Gardener by Cinead McTernan, delicious container recipes to grow together and cook together. 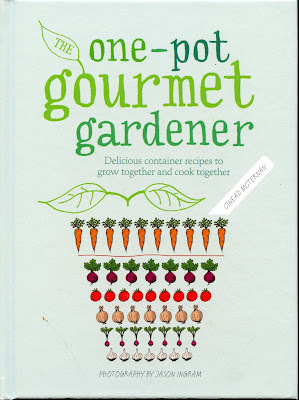 If you have been following my blog then you'll know that I'm growing vegetables in containers this year, so this book is right up my street. With these exciting container recipes, you can grow all the ingredients you need for a single dish in a single pot. One-Pot Gourmet Gardener presents 25 carefully devised container recipes grouped into soups and salads, delicious main courses, handy picnics, quick suppers and divine drinks and puddings, including gazpacho, garden pizza, ratatouille, smoothies, sauces and tarts. Each one-pot recipe provides every step from sowing to serving. And after being guided through an introductory masterclass on how to grow crops in pots, readers will have the confidence and skills to devise their own one-pot recipes. With a little planning you can prepare the food for a one-pot celebration, when you sow the crops in spring! The concept of this book is simple, plant up a container with a variety of herb and vegetable plants, then when they have grown, you are ready to make the recipe. All of this is explained in the Introduction which tells you how to get started and encourages everyone with even the smallest patio balcony or roof garden to give growing your own a go. Everything from choosing a pot, tools and equipment to compost, positioning your pot, watering, pests and diseases, harvesting and storage is covered at the start of the book . For each recipe there is a 'Grow Me' section and an 'Eat Me' section. Here are some of the recipes which I found attractive: Courgette and Fennel Tart, Hummus Three Ways (including Carrot Hummus), Honey and Thyme Blackberries with Thyme Shortbreads. Kale and Celery Soup, Rainbow Chard Pesto, Radish and Shallot Pickle and Pimms Jelly. Everything you need to learn how to grow vegetables and herbs in containers. A variety of interesting, well written recipes, good photographs and clear instructions for sowing and growing. 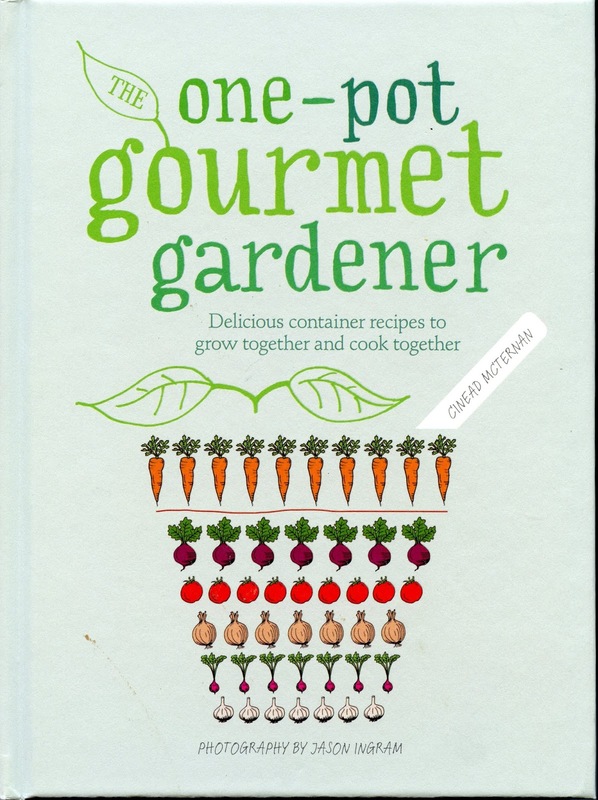 A fun book which would be a good gift for a gardening cook or a cooking gardener! The containers looks as attractive as containers of flowers with the variety of plants really complementing each other. As you will see below, I was impressed by the Carrot Hummus, and I'm sure many of the other recipes will be well worth making too. Place the carrots on a baking sheet, drizzle with oilive il an season. Roast in the oven until soft - about 30 minutes. When the carrots have cooked, place them adn the remainder of the ingredients into amixer and blitz until blended and smooth. Spoon into a bowl and level to remove any air pockets. 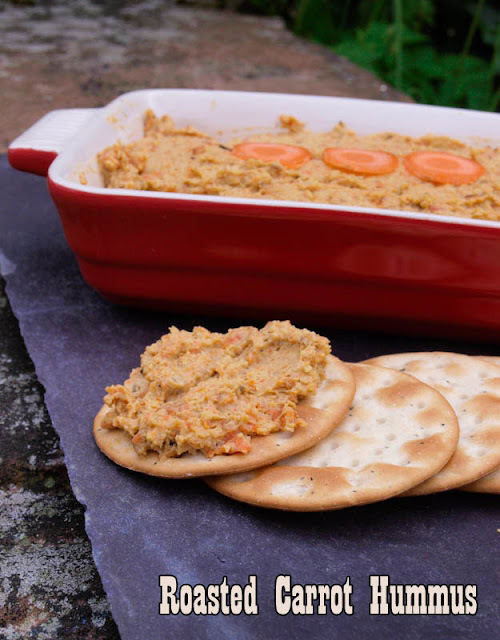 As I said at the beginning of this post, this is a truly delightful recipe, roasting the carrots brings out the sweetness and combined with the other ingredients it makes a delicious spread or dip. To order One-Pot Gourmet Gardener at the discounted price of £12.99 including p&p* (RRP: £16.99), telephone 01903 828503 or email mailorders@lbsltd.co.uk and quote the offer code APG311. *UK ONLY - Please add £2.50 if ordering from overseas. LOVE the look of this Houmous! It's one of my favourite things to make/eat, bet the carrots are smashing... Good luck with the pots! It's not just in the far north Janice, we can't grow outdoor tomatoes here in Cornwall either or aubergines. Lots grown in greenhouses and polytunnels, but that's a different story. Roasted carrot hummus sounds fabulous - bookmarked!